Our Engraved Coolers are popular for any bachelor party. These great coolers are sure to keep all your groomsmen's drinks nice and cold all day long. Our Engraved Can Cooler measures 3" in diameter and features silver-plating along with a grey foam huggie. Every Engraved Can Holder includes FREE Engraving! Personalize your Silver-plated Can Cooler with any engraved initials, name or up to 5 lines. I love it! I can't wait to give it to him! Beautilul appearance but the ingraving was hard to read. 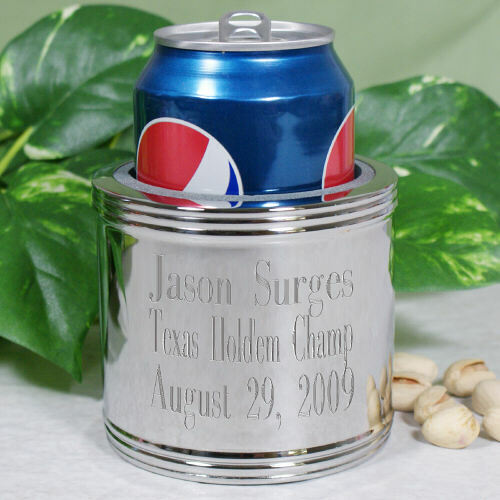 Engraved Bottle Coolers make an excellent engraved Father's Day Gift idea! Unique wedding party gift ideas personalized for your entire wedding bridal party. Create a complete collection for the entire family to use at the next Family Reunion. We also carry an wonderful selection of Personalized Wedding Gifts & Personalized Bridesmaid Gifts. GiftsForYouNow.com can provide your entire wedding party with attractive Personalized Bridal Party & Wedding Party Gifts, as well.